Some Kansas turkey hunters simply shake their heads and act ashamed at how easily a feathered animal escapes human hunters. They will look down and mumble about how “wary” or “henned-up” the birds are and how well they see, hear and become spooked. Other Kansas turkey hunters laugh at how stupid these wild birds can be. 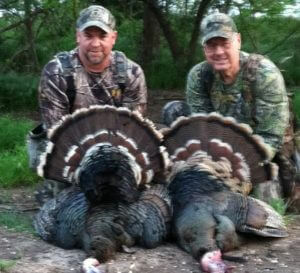 In these cases, the hunter probably shot a lusty tom turkey as he came within range of the hunter’s shotgun, making for an easy first-day hunt kill. So which is it? Do the birds outsmart, outwit, out-maneuver people? Or are they basically dumb, love-stricken birds that are so easily fooled? The answer likely is found somewhere in between the two, but it depends on the hunter’s approach. Turkey’s detect movement well and see every moving thing as a potential predator and threat. They use their hearing to listen to the calls of other birds, but noises can spook them too. Humans would do well to remember what they have on their side. First, humans can plan an attack. Hunters, if they make the time to do it, can pattern where turkeys roost, mate, eat, dust off and then roost again. Knowing where they sleep and having an idea of where they move daily is a huge advantage. If walking through the woods has spooked more turkeys than put on the dinner table, perhaps scouting more is the answer. Second, humans can enhance their eyesight. It’s called using binoculars. Purchasing and spending time glassing in the woods can help hunters plan their setup. Hunters should purchase binoculars that are easy to carry in case a lot of walking is involved in the hunt. Third, humans have all sorts of methods to hide in the woods. The camouflage clothing and hunting blind markets are incredibly large. Finding camo patterns to match the environment on the hunting property is easy. Realizing that movement spooks turkeys—even with hunters wearing the camouflage—is harder to swallow for some hunters. Buy quality camouflage but sit still. Humans obviously have many more talents than wild turkeys. But start with these three tips to recognize the talents of Kansas turkey yet not be intimated by them.